I have not gone completely mad but yes we are talking about the escape of pyjamas. From the bedroom to the catwalk and now on your high-street. It’s taken me a little while to get around to it but I am strangely liking this trend. I must say that my 6ft tall frame lends itself well to this style. I styled this looks this three ways. This is just part 1. If your feeling bold, why not wear the matching top and bottom as I have done here . Great accessories are essential here. Bangles, statements hand bags and fab shoes. I also opted for bold lips and flawless makeup to avoid looking like I just woke up from sleep and rolled out of bed. 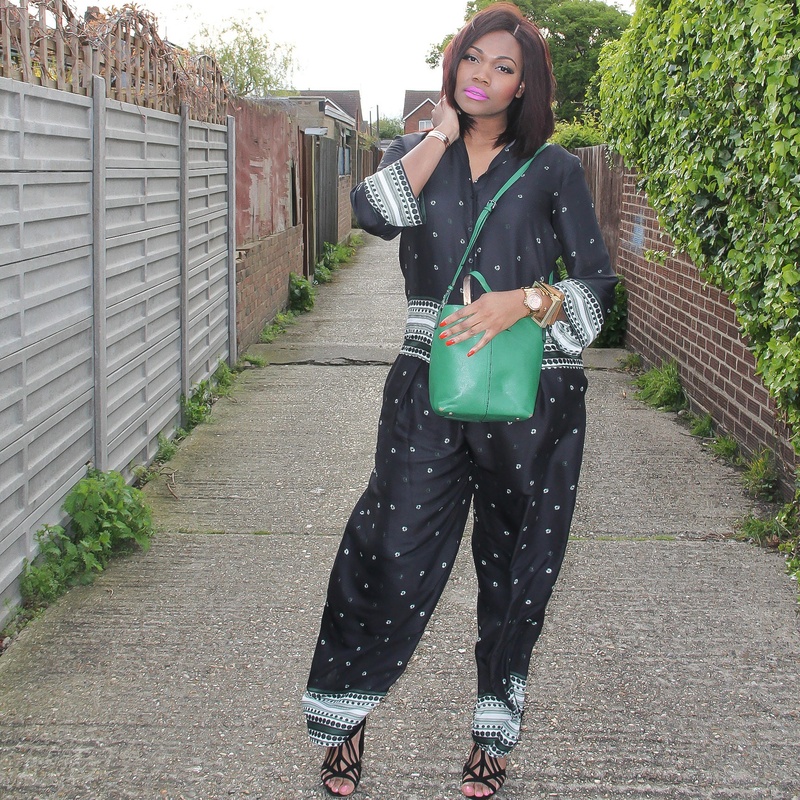 This green shoulder bag brings out the print details on this outfit and the bright pink lips makes for a great contrast. These photos were taken on a fairly windy day and as you can see there is lots of movement in both the pants and blouse. It’s not silk but the light polyester fabric was very cooling. 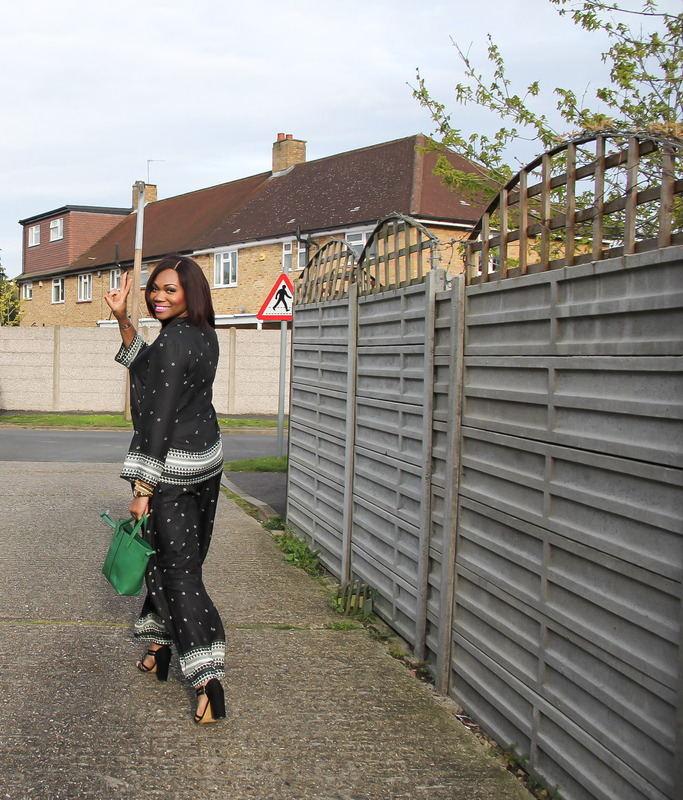 This pyjamas inspired set was bought from the trusted Marks and Spencer Autograph range. Marks and Spencer have a long collection on certain styles. This pants were labelled long and truly the length is not bad; but it’s not for ideal for the 6ft and over club. Stay tuned for part 2 to see my second take on this trend/look. 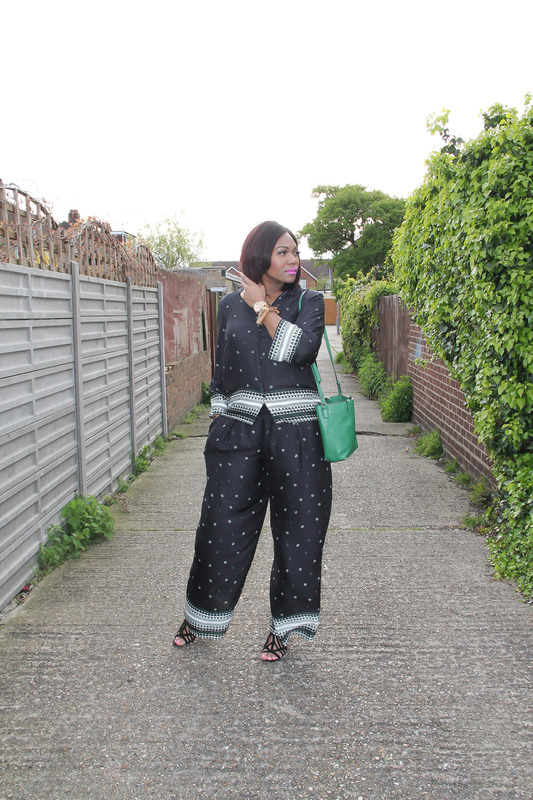 -Scarf print blouse and wide leg trousers -Marks and Spencer . Ok … see you soon.